Walking burns calories to aid in weight loss. Walking is an easy exercise that can help you manage your weight. As a bonus, walking requires no equipment and doesn't cost a cent. However, it won't melt fat from your stomach or your back. The only way to slim these regions is to lose weight all over -- which typically requires dietary changes along with walking or other exercise. Then, tone your back and stomach with strength-training moves for muscle definition. It's good exercise, but walking isn't a quick fix for fat loss. A pound of fat is about 3,500 calories, which means you need to burn that much more than you eat to lose a pound. Walking at a moderate speed of 3.5 mph, a 155-pound woman burns just 150 calories in half an hour. It gets better when you speed up -- the same woman burns 186 calories in half an hour at 4.5 mph -- but walking still makes a relatively small dent in the calorie equation. For maximum burning, walk uphill or try race walking. That 155-pound woman burns about 225 calories on a half-hour hike, or about 245 calories speed walking at 5 mph or faster. If you're after muscle definition in the stomach and back, walking won't do nearly as much as targeted resistance training. For ab toning, try crunches and situps. For your back, perform supermans by lying on your stomach with your arms and legs extended; then lift your limbs and head a few inches from the ground for several seconds at a time. Work your stomach and back together with front planks, which involve lying on your stomach and bending your elbows to 45-degree angles. Then place your weight on your forearms and toes, keeping your legs and torso straight and stiff for at least five seconds per rep.
For weight loss, 300 minutes of moderate walking per week is ideal. Race walking and uphill walking are more vigorous, so you can get away with just 150 minutes per week of these activities. In addition to walking, perform resistance exercises three times weekly. Along with your stomach and back, work your chest, arms, legs and hips for good balance. See your doctor before starting a new exercise routine. 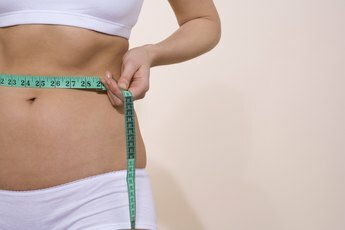 The fastest way to shed fat is to eat less; most women under 250 pounds lose weight eating 1,200 calories per day, according to MayoClinic.com. Put down the nachos and potato chips, and fill your plate with fresh produce like apples, berries, carrots, tomatoes and leafy greens. Pair your veggies with whole-wheat breads and pastas or brown rice, and include lean proteins such as egg whites and lentils.